Everyone knows Cinderella, Sleeping Beauty, Snow White and Rapunzel, but what about the men in their lives? In the stories passed on by their kingdoms' bards, they are all referred to as Prince Charming. But Frederic, Liam, Duncan and Gustav are all princes who want to be known. And when they find themselves thrown together on the adventure of their lives, they are determined to finally make a name for themselves. I saw The Hero's Guide to Saving Your Kingdom by Christopher Healy sitting on a new book shelf at the library and I just couldn't resist. If you read my blog, you know this is odd since I don't generally read middle grade fiction myself. But I loved the idea of this book and it sounded quite funny. I also have been looking for options for my son to read, so I figured I'd preview it and see if it was appropriate for him. I laughed my way through The Hero's Guide. While I stumbled over the princes' names, since I am used to the Disney versions, I loved everything else about this book. Each of the princes has a unique personality and some major issues, generally related to the princesses with whom they are matched. There's Frederic, who has been sheltered to an extreme by his overprotective father. And Liam, who was startled to discover Sleeping Beauty's real personality when she woke up. There's Duncan who is rather clueless, but seems the perfect match for Snow White. And Gustav, who is in a constant competition with his 17 brothers. Each of them made me laugh and cheer from beginning to end. The writing style was fun; many times the narrator speaks to the reader to give them a little taste of what's to come. All of the extra characters, including trolls, a giant and a group of bandits led by a 10 year old were fabulous additions to the story. And Rapunzel's witch, who has kidnapped Cinderella and the bards of all four kingdoms, was a great villain. I will say I'm unsure as to whether my 8 year old son would enjoy The Hero's Guide as much as I did, but it's definitely written in a way that is appropriate for younger audiences. There is a bit of violence but it's mostly done in a humorous way. I highly recommend this to boys who have little sisters who love the princesses, and parents who have read princess stories over and over ~ as I have! I'm sure older girls would also enjoy this take on the infamous princesses and their princes. 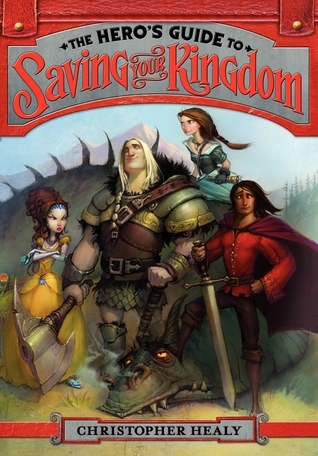 This review was written based on a copy of The Hero's Guide to Saving Your Kingdom that I borrowed from the library.